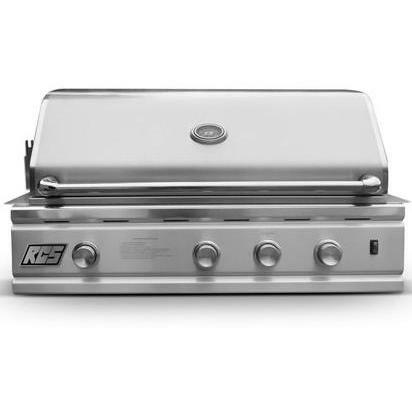 The RCS Cutlass Series 36 inch propane gas grill features three (3) stainless steel burners for 45,000 BTUs of power, plus a 20 inch stainless / ceramic rear rotisserie burner for 12,500 BTUs for a combined total of 57,500 BTUs. This grill is constructed of 304 stainless steel, making it the last grill you will ever need! This RCS grill also includes grilling zone separators that isolate specific cooking conditions to the specified grilling section. The stainless steel flame tamers prevent flare-ups for safer cooking, and heavy duty stainless steel cooking grids distribute even heat for ideal grilling conditions. Cook delicious rotisserie meals in your own backyard with the included rotisserie kit. Enjoy a reliable startup every time, with the Sure-Strike ignition system, and interior halogen lighting provides visibility for cooking in the evening. The heat indicator installed in the hood helps you monitor cooking temperatures during your grilling experience. With a 586 square inch primary cooking area, and a 218 square inch secondary cooking area, the RCS RON36A propane gas grill gives you a total of 804 square inches of grilling space. Requires purchasing LP hose and regulator separately.